It is hard to believe it has been five weeks yet at the same time it seems longer. I looked outside from the sun room and every bird feeder was empty. Not a morsel. So I went out into the sunlight loaded down with seed, suet and peanuts and started making the rounds. By the time I made it to the feeder hanging from a branch on one of the big pine trees, I already began to feel better. The pine branches have really grown. I had to separate the branches to reach the feeder. The smell is glorious and the needles on the new growth are soft as they brush past my cheek. I smile thinking that your dad would be worried I was wearing my sandals and no hat. I took a deep breath of pine air and worked my way over to the big maple tree that holds the squirrel feeder and where Bossy Backyard Blue Jay prefers to pick up his peanuts. I see the chipmunks burrows and carefully walk around the entrance. Filling the feeder and looking up through the leaves of the maple I realize how important being outside is to me and even if it is only for just a few moments today, it helps. I thought about the book by Richard Louv, Last Child in the Woods: Saving Our Children From Nature-Deficit Disorder . Louv’s book is about how the replacement of open meadows, woods and wetlands by manicured lawns, golf courses and housing developments has led children away from the natural world. What little time they spend outside is on designer playgrounds or fenced yards and is structured, safe and isolating. These spaces offer little opportunity for exploration, imagination or contemplation. The author discusses the restorative qualities of nature and recommends that we reacquaint ourselves with nature through hiking, fishing, bird-watching and disorganized, creative play. That is how I spent my childhood. Outdoors. Swimming, playing in the backyard, walking barefoot for crying out loud, barefoot! Drinking water from the hose in the backyard, laying in the grass looking at the clouds and not thinking a few mosquito bites were going to make me ill. I miss Africa. The smells, the sky, the sound of the ring necked dove. It was still daylight, so I finally got a few tomato plants into the container garden and a basil plant too of course. This year I planted lavender. I thought it would smell nice when the breeze blows into the sun room. I almost forgot to tell you a few days ago a young red fox was in the yard. His front right leg was injured and he looked pretty thin. He had his eye on three baby raccoons but they were too quick for him. This fox came and sat outside the office door. I worried because I was standing at the sliding door and he had to see me but he didn’t move. He looked so tired. I called a wildlife rehabilitation center but he limped off and we haven’t seen him since. I picked up your water fountain, washed and dried it and put it in the cupboard. I washed your little rug where you liked to eat your food too. 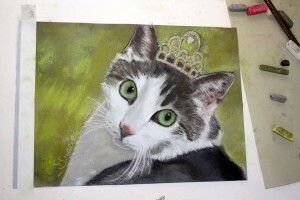 A beautiful pastel drawing came in the mail from Jill at Pets In Tiaras. The green is just perfect, just like your eyes. Our little princess Gracey. Your dad is recovering from his first kidney stone. It gave us quite a scare. We are doing our best. I still miss the little Gracelet and I cry when I see that sweet little picture of her looking up at us. You guys take care; I’m glad you’re continuing this site in the sweet pea’s honor. Thank you. Bless you, Joane, for continuing on. And two new kittens!!!! What a wonderful way to remember Gracey!!! I have that key chain hanging on the front of my fridge. I look at Gracey every day. Thank you for sharing your journey with all of us. What an uplifting post. Joanne that was such a heartwarming post. Thanks for sharing. Joanne, We all miss Gracey too, and we send you lots of love. I also read Last Child in the Wood. It is so true. When I take my son to the park, many of the tweens and teens are looking at iPads! I hope the fox’s leg healed up and he is able to run free and live his best life. Thanks for reading Robin. I too cry still & grieve w/you for Gracey. She touched so many lives & will continue to do so, keeping her memory alive to help & love all creatures big & small. Joanne,I cry every time I read your letters to Gracey. They are so touching and heartfelt…I know what heartbreak you must be enduring. We miss Gracey so much! Thank you Beth. I hope you will smile too when you think of Gracey. I don’t mean to make you cry. Thank you for missing Gracey too Jesaka. Thank you for reading Amy. As you well know, the pain begins to transition to an ache that remains. Hugs to you and the memory of your sweet Sebastian.